Montgomery & Associates (M&A) is pleased to announce that Lisa Porta, P.E., joined its Sacramento office as a senior water resources engineer effective January 14, 2019. 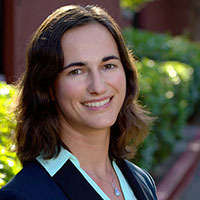 Ms. Porta, who has more than 10 years of groundwater and integrated water planning experience, comes to M&A from Jacobs (formerly CH2M) where she worked extensively on water resource studies across California and the Western United States. Ms. Porta has technical expertise in groundwater modeling, water supply planning, impact analysis, and water resources management. She has developed groundwater models and planning documents for several state and local agencies that are helping water and irrigation districts to better manage their groundwater supplies and to navigate an increasingly complex regulatory environment (related to California’s Sustainable Groundwater Management Act [SGMA] and Irrigated Lands Regulatory Program [ILRP]). Ms. Porta is registered in California as a professional civil engineer with a specialty in environmental and water resources. She earned a Master of Science in environmental science and engineering from the Colorado School of Mines and a Bachelor of Science in biological systems/agricultural engineering (water specialty) from Texas A&M University after completing a two-year, bilingual engineering preparation program in Southern France. Ms. Porta has an international background and is fluent in French, German, and Italian. An expert on SGMA and ILRP, Ms. Porta is a statewide leader in groundwater resources. She was recently elected to the California Groundwater Resources Association (GRA) Board of Directors. Ms. Porta has been an active GRA member since 2011, has served on a workshop planning committee, has planned and moderated sessions at three GRA events, and is the current chair of the Technical Committee. For more information about M&A and its operations in California, contact Ms. Porta or Cameron Tana.